2 to 1 Gear reduction box with idler gear so the input and output shafts turns the same direction. NOTE: Sale price is limited to stock on hand. Use your drill to power this. NOTE: The Drill is NOT included. You can motorized all types of products. 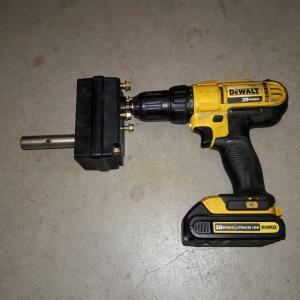 Using your own cordless drill or electric motor. The Hex shaft is the Input shaft. Has Ball bearings on the output shaft. Hole in shaft is .247", 1.5" from the end. Input Hex flat to flat is: 0.383"
Input Hex edge is: 0.427"
Dixon STAINLESS STEEL Hose Clamp HS-24 or # 24 1-1/16" to 2"